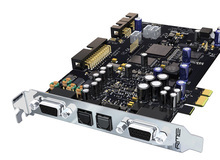 RME Audio introduces the HDSPe OPTO-X extension board. RME’s new HDSPe MADI FX is now available. At Musikmesse 2012 in Frankfurt RME presents the new HDSPe MADI FX PCI Express card. E-MU's 1010 PCIe card is in stock and for sale on the www.creative.com webstore. RME is now shipping HDSPe AIO, its new 38-Channel 192 kHz Multiformat PCI Express Card. Solid State Logic have announced the release of MadiXtreme.